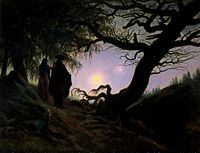 Caspar David Friedrich (September 5, 1774 – May 7, 1840) was a nineteenth-century German romantic painter, considered by many critics to be one of the finest representatives of the movement. Romanticism was an artistic and intellectual movement that originated in late eighteenth-century Western Europe. In part, Romanticism developed as a revolt against aristocratic social and political norms of the Enlightenment period and a reaction against the rationalization of nature. In art it stressed strong emotion as a source of aesthetic experience, placing a new emphasis on such emotions as trepidation, horror, and the awe experienced in confronting the sublimity of nature. 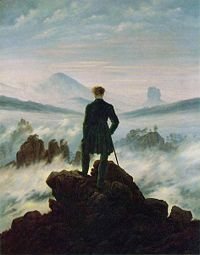 Friedrich's paintings, such as Wanderer above the Sea of Fog expressed the feeling of sublimity. Friedrich was born in Greifswald in northeastern Germany. 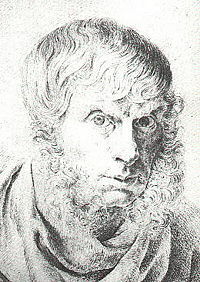 He studied at the Academy in Copenhagen (1794-98), and subsequently settled in Dresden, often traveling to other parts of Germany. Friedrich's landscapes are based entirely on those of northern Germany and are beautiful renderings of trees, hills, harbors, morning mists, and other light effects based on a close observation of nature. Some of Friedrich's best-known paintings are expressions of religious mysticism. In 1808 he exhibited one of his most controversial paintings, The Cross in the Mountains (Gemaldegalerie, Dresden), in which—for the first time in Christian art—an altarpiece was rendered as a pure landscape. The cross, viewed obliquely from behind, is an insignificant element in the composition. More important are the dominant rays of the evening sun, which depicted the setting of the old, pre-Christian world. The mountain symbolizes an immovable faith, while the fir trees are an allegory of hope. Friedrich painted several other important compositions in which crosses dominate a landscape. 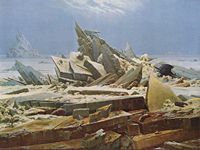 Even some of Friedrich's apparently nonsymbolic paintings contain inner meanings, clues to which are provided either by the artist's writings or those of his literary friends. For example, a landscape showing a ruined abbey in the snow, Abbey Under Oak Trees (1810; Schloss Charlottenburg, Berlin), can be appreciated on one level as a bleak, winter scene, but the painter also intended the composition to represent both the church shaken by the Reformation and the transitoriness of earthly things. 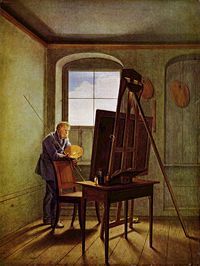 After the development of sepia drawings and watercolors (mainly naturalistic and topographical), Friedrich took up oil painting after the age of thirty. His paintings were modeled on his sketches and studies of scenic spots, like the cliffs on Rügen, the surroundings of Dresden or the Elbe and later composed in symbolic, often symmetrically-balanced compositions. His first mature style painting is the Tetschen Altar (1807) in which the crucified Christ is seen in profile in the top of a mountain, alone, surrounded by nature. In his time this work was not unanimously accepted for the principal role of landscape in a religious subject, however, this was his first appraised painting. His famous Romantic painting The Wanderer Above The Sea of Fog impressed Karl Friedrich Schinkel (later Prussia's most famous classicist architect) so much that he gave up painting and took up architecture, much to the benefit of German and world architecture. Friedrich's masterpieces were almost forgotten by the general public in the second half of nineteenth century and only at the end of nineteenth and beginning of twentieth century he was rediscovered by symbolist painters for his visionary and allegorical landscapes. For that same reason, Max Ernst and other surrealists saw him as a precursor of their movement. Along with other romantic painters like J. M. W. Turner and John Constable he made landscape painting a major genre in Western art. Friedrich's style influenced the painting of the Norwegian Johann Christian Dahl but the successors of his painting style did not achieve his mastery and depth. Arnold Böcklin was strongly influenced by his work and perhaps also the painters of the American Hudson River School, the Rocky Mountain School, and the New England Luminists. Friedrich also sketched monuments (a memorial) and sculptures for mausoleums, which reflects his obsession with death and the afterlife; some funereal art in Dresden's cemeteries are his. Some of his masterpieces were destroyed due to a fire in Munich's Glass Palace (1931) and in the bombing of Dresden in World War II. "The painter should paint not only what he has in front of him, but also what he sees inside himself. If he sees nothing within, then he should stop painting what is in front of him." Web Gallery of Art - comprehensive collection of Friedrich's works. Artcyclopedia - links to Friedrich's pictures from Image Archives, articles, etc. History of "Caspar David Friedrich"
This page was last modified on 17 January 2017, at 17:12.